R' Chaim Kanievsky on saying the prayer for rain and dew in Eretz Yisroel: "Each according to the custom of his forefathers." "כל אחד לפי מנהג אבותיו"
"One Tisha B'Av afternoon in the late-80s, photographer and filmmaker Judah S. Harris took a walk in Harlem in search of some of the synagogues that once existed in this former Jewish neighborhood. "Written a decade ago (2006), his essay "Where Synagogues Once Stood" documents his exploration of the places where synagogues once stood, both in New York City and also in Jerusalem, where the grandest of synagogues once welcomed an entire people. ""Visiting the places where synagogues once stood, where Jewish communities once thrived... can be one way of internalizing the meaning of Tisha B'Av, especially if the structures — their exterior architecture and Hebrew inscriptions — still remain visible but the life within them does not."" 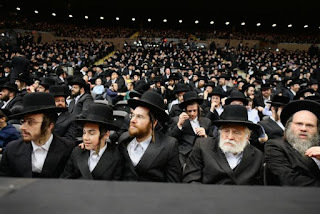 20,000 erliche yidden gathered at the Nassau Coliseum last night to say Zionism is not Judaism. But the NY Times, the NY Post, and the NY Daily News fail to mention it even though they have articles on far smaller protests like a tiny gathering concerning gun control. But Rav Hirsch would be proud of the righteous Jews. "Israel should be one nation, an entire nation that should have no other foundation for its existence, survival, activity and significance other than this Torah. It is to see the realization and devoted observance of this God-given "fiery Law" as its one contribution in world history for the edifice of human salvation. What the Phoenicians sought to bring about with the keels of their ships, what the ancient Greeks sought to achieve with their chisels and what the ancient Romans sought to attain with their swords, Israel is to accomplish with its Torah. Nay more, Israel is a nation that became a nation only through and for the Torah, a nation that once owned a land and existed as a state only through and for the Torah, and which possessed that land and that statehood only as instruments for translating the Torah into living reality. This is why Israel was a people even before it possessed land and statehood; this, too, is why Israel survived as a people even after its land was destroyed and its statehood lost, and this is why it will survive as a nation as long as it does not lose this only מורשה, this sole foundation for its survival and significance. That is the kind of nation that Israel, that all of us, should be."